Owners of .40 S&W pistols, look no further. 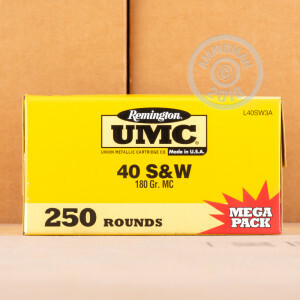 Save big on ammo with this massive 1,000 round case from Remington UMC! 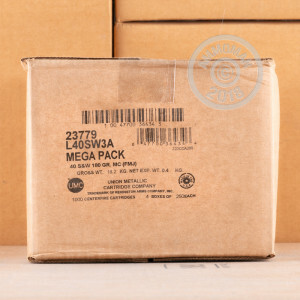 This case contains four 250-round packs of .40 Smith & Wesson ammo. Each round fires a standard weight 180 grain full metal jacket (metal case) bullet at slightly under 1,000 feet per second. An excellent choice for owners of .40 caliber pistols like the Glock, XD, or M&P. 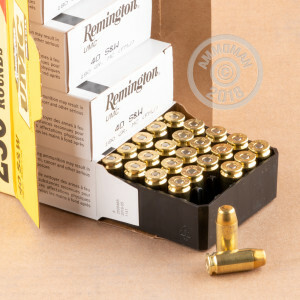 This ammunition is manufactured at Remington's ammo plant in Lonoke, Arkansas using non-corrosive Boxer primers and brass cases. It's an amazing value, especially at AmmoMan.com, where all orders over $99 ship for free!